To order this book from Sparks Auctions, click on the book's price at right. 122 pages, 8.5x11, spiral bound. Colour C$ 56.00 [ISBN 978-1-927119-29-7]. Rationing affected all citizens of Canada and Newfoundland during World Wars I and II. During WWII an extensive system of ration books with coupons or special forms for things less in demand, was developed. Food items such as milk, evaporated milk, tea, coffee, butter, dried eggs, sugar and meat were affected, as were commodities such as alcohol, gasoline, metals, rubber, timber, farm machinery and motor vehicles, and even items like electric stoves and hot-air furnaces. Temporary ration books were designed for service personnel home on leave so the amount of food available to their families would not be reduced during the visit. 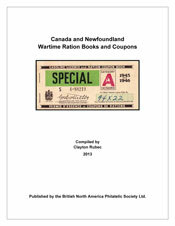 “Canada and Newfoundland Wartime Ration Books and Coupons” examines mainly how the rationing system was administered during WWII, with extensive tables detailing its many variations and copious illustrations of the many different ration books, decals and coupons used. Ration coupons are thought of as both stamps and currency but perhaps are neither. They are an adjunct to collecting interests such as war savings stamps and bonds that were part of the war efforts of both nations. Regardless, numerous stamp and coin collectors are interested in the subject. As pricing for ration coupons, books and documents can be very robust, they are worth taking seriously. The author's objective in preparing this book is to expand knowledge of this interesting side-line to Canadian philately, and he has succeeded. Clayton Rubec graduated with a B.Sc. degree from Queen's University, Kingston, Ontario and an M.Sc. degree from McMaster University, Hamilton, Ontario with additional post-graduate studies from several universities and institutions. In his work related to wildlife, wetlands and habitat conservation science, policy and international treaties, he has travelled to over 45 nations. He is an environmental scientist who retired from the Government of Canada in 2008 after 34 years of public service. His last federal government position, with the Canadian Wildlife Service of Environment Canada, was as Senior Policy Advisor. He is currently Vice-President of the Centre for Environmental Stewardship and Conservation (CESC) based in Ottawa, Ontario. Mr. Rubec has authored or co-authored over 195 books, journal papers, reports and other articles - a few of which deal with philatelic subjects. He is a collector of both Canadian and Iraqi stamps, postal history and revenues with obscure interests in philatelic ephemera from several other countries. He is a member of the British North American Philatelic Society, the Postal History Society of Canada, the International Peat Society and the Society of Wetland Scientists. He and his wife Leslie are also avid Chicago Cubs baseball fans. This page was last modified on 2019-02-27.